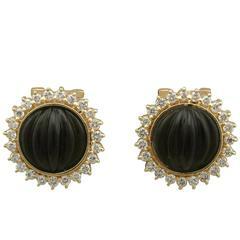 Modernistic, elegant, large, pear shaped, rounded black onyx stones are bezel set in highly polished 14 karat yellow gold, with posts and friction backs for pierced ears. Well designed and well made, these earring feature posts which are nicely centered to sit beautifully on the ears. These earrings are large, yet very easy to wear. Hallmarked "14k PBD". Face of earrings measure 32.27 mm long x 22.73 mm wide x 7.2 mm deep. Earrings weigh 14 grams.